To quicken up the launching of a program, users want to create shortcut keys corresponding to their activities. But users sometimes become confused and completely forget the shortcuts. 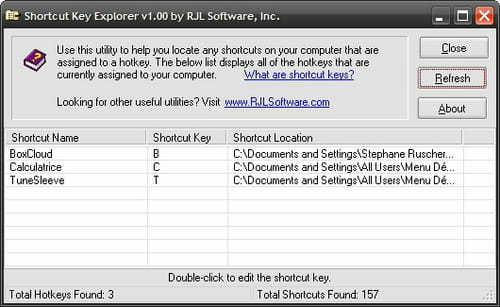 Shortcut Key Explorer is a program to display all the shortcuts in Windows. Analysis: right after its downloading, Shortcut Key Explorer starts analyzing the system. After the investigation, all existing shortcuts on the system will be displayed thanks to the software. Users will have an overview of them. By double-clicking on the item, users can find the Windows Shortcut properties (name and location). Shortkey creation: Shortcut Key Explorer allows users to create any shortcuts and then assign a hotkey to launch it quickly. For example, the user may create a shortcut for a drive or for recent documents and then a hotkey will be assigned to launch it. Portable: as a portable utility, Shortcut Key Explorer requires no installation and works on any device. It displays shortcut keys on Windows, Windows Vista and Windows 7. The software has been created to make easy the use of shortcuts to quicken the launching of a program. An icon has been added to make the difference between application shortcuts and website shortcuts. There is no way to manage and view the shortcuts. Latest update on October 16, 2016 at 04:50 PM.